originally uploaded by Shortride on Mar 11, 2011. Patrick Rothfuss Signs in San Diego! Patrick Rothfuss has created quite a stir in the fantasy community, with Patrick Heffernan as his faithful advocate. 2007's The Name of the Wind, followed by 2011's The Wise Man's Fear, gained Pat a large fan base; one that brings the hype for his still-untitled third Kingkiller Chronicles novel to an all-time high. This fall, fans can return to the Chronicles' world with The Slow Regard of Silent Things, a novella centering on one of the series' most intriguing characters, Auri, a young woman living in the dark passages underneath the series' university. This is a numbered event – numbers for the signing line are free with the purchase of The Slow Regard of Silent Things from Mysterious Galaxy, available October 28th, starting at 10 AM! 7PM WEDNESDAY, JUNE 4 Patrick Rothfuss | The Wise Man's Fear: The Kingkiller Chronicle Day Two New York Times bestselling author Patrick Rothfuss visits with the second book in his Kingkiller Chronicle, The Wise Man’s Fear. Kvothe searches for answers, attempting to uncover the truth about the mysterious Amyr, the Chandrian, and the death of his parents. Along the way, Kvothe is put on trial by the legendary Adem mercenaries, forced to reclaim the honor of his family, and travels into the Fae realm. Kvothe takes his first steps on the path of the hero and learns how difficult life can be when a man becomes a legend in his own time. ABOUT THE AUTHOR Patrick Rothfuss currently lives in central Wisconsin where he teaches at the local university. He loves words, laughs often, and dabbles in alchemy. His first novel,The Name of the Wind, was a 2007 Quill Award winner and a Publishers Weekly Best Book of the Year. Its sequel, The Wise Man's Fear, debuted at #1 on The New York Times bestseller list and won the David Gemmell Legend Award. His novels have also appeared on NPR's Top 100 Science Fiction/Fantasy Books list and Locus Best 21st-Century Fantasy Fiction Novels list. He can be found at patrickrothfuss.com. Join author Patrick Rothfuss as he discusses and signs copies of his book "The Name of the Wind"
Sunday, May 20, 4:00 p.m.
Patrick Rothfuss on tour for The Wise Man's Fear. Patrick Rothfuss promotes The Wise Man's Fear. Patrick Rothfuss reads from The Wise Man's. In 2002, he won first place in the Writers of the Future contest with the story, "The Road to Levinshir". This story was published in Volume 18 of the "Writers of the Future" anthology. Patrick Rothfuss is a LibraryThing Author, an author who lists their personal library on LibraryThing. Patrick Rothfuss is currently considered a "single author." If one or more works are by a distinct, homonymous authors, go ahead and split the author. 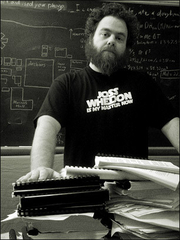 Patrick Rothfuss is composed of 10 names. You can examine and separate out names.